Lough Cutra Castle hosted the Prince of Wales and the Duchess of Cornwall on their recent official visit to Ireland. The couple attended a private dinner with President Michael D Higgins and his wife Sabina at the South Galway castle where they were staying on Tuesday night. The couple returned to the venue after their programme of engagements on Wednesday, before flying to the North from Shannon Airport on Thursday morning for the second leg of their four-day Ireland visit. President Michael D Higgins and his wife, Sabina arrived at Lough Cutra Castle estate shortly after 8pm on Tuesday. The Prince of Wales and the Duchess of Cornwall had arrived at the well-known South Galway estate earlier in the evening, after an exhausting schedule of events as part of the couple’s first official visit together to the Republic of Ireland. The President and Mrs Higgins were greeted by Prince Charles and his wife, Camilla in the tiled hallway of the privately-owned castle in front of a roaring fire. The Prince of Wales and President Higgins are understood to have built up a friendly rapport in recent years, having met on the State visit to Britain in 2014 and at the Gallipoli centenary commemorations in Turkey just last month. 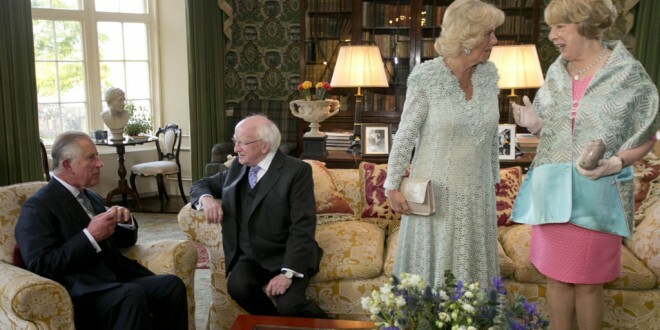 That warmth was on display again as both the royal couple, President Higgins and his wife were at ease for photographs in the ornate Gough room, named after its former owners, for a brief reception overlooking the lakeshore as the sun set. There has been a noticeable garda presence in the area in recent weeks but particularly on Monday and Tuesday, when gardaí were posted at each gate to the estate and in the various towns and villages through which the convoy, including the prince, duchess, the British Ambassador Dominic Chilcott and representatives from the British embassy and Clarence House, passed. Locals photographed the motorcade containing the heir to the British throne as it passed through Gort, Kilcolgan, Ballinderreen and Kinvara. Helicopters were reported flying in South Galway early on Tuesday morning, prompting suspicions that Charles and Camilla had stayed in Lough Cutra on Monday night. 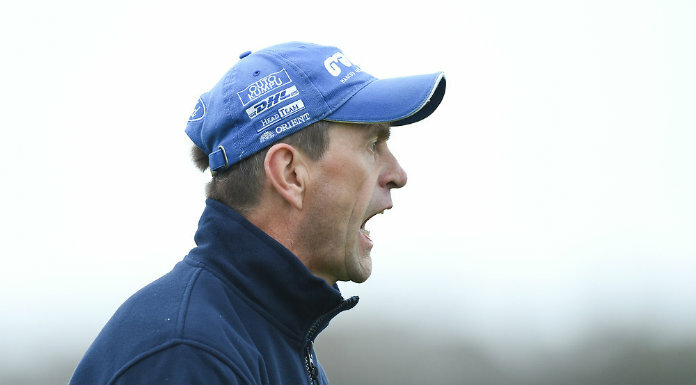 However, the couple landed in Shannon Airport on Tuesday morning. The castle and estate is owned by the Gwyn Jones family and the grounds will be the scene of a different type of gathering later in the week, when the Lough Cutra Triathlon takes place there on Sunday. A small number of invited guests attended Tuesday’s dinner, including An Tánaiste Joan Burton. On the menu was blanched highgrove asparagus with hollandaise sauce for starters; pan-seared fillet of hailbut, crushed jersey royal potatoes, spinach and a lemon cream sauce, followed by natural yogurt pannacotta with poached highgrove rhubarb. 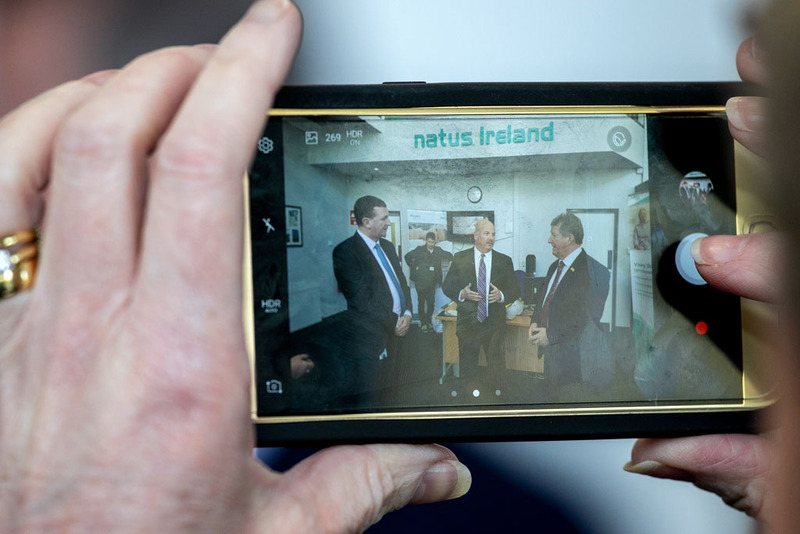 Earlier in the day, Prince Charles had visited the Burren outside Carron, as well as attending a reception in NUI Galway and met An Taoiseach at the Marine Institute. The Duchess of Cornwall spent her afternoon in Galway City, calling to the Claddagh National School, enjoying a tasting of foods from the Wild Atlantic Way at the House Hotel and a special theatre performance by Druid. 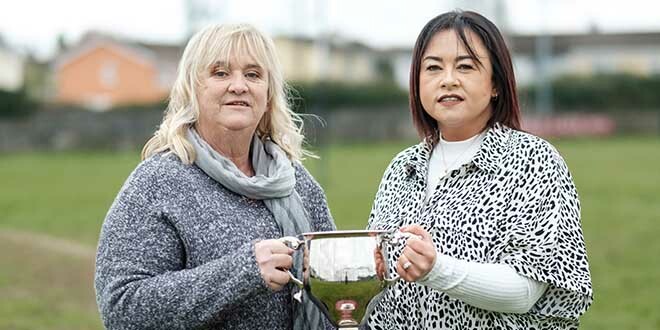 On Wednesday, the pair continued their visit to the Republic with a trip to Sligo, Drumcliffe and Mullaghmore, before going on to a two-day programme in Northern Ireland.